For Swiss Style Machines with widths from 1.5 mm through 3.24 mm / .059 inch through .128 inch. External grooving for Swiss Style Lathes with zero offset for part accuracy. Mono block design offered in inch and metric sizes for a wide variety of applications. Holders offered with various groove depths to optimize productivity. 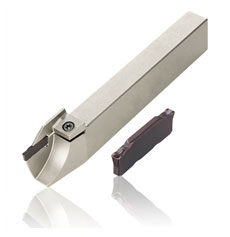 Inserts offered in a wide variety of grades, widths and edge preparations. Molded and ground inserts for the most demanding manufacturing needs. Swiss style machines for doing grooving applications. Swiss style machines for cutoff applications. Swiss machines that are wanting to maximize productivity. Applications where current tool offerings are having difficulty. Where you want to utilize grades and edge preparations to optimize performance. GY offers a wide variety of inserts for optimum manufacturing. Ground and molded inserts for different materials and applications. Variable cut off and groove depths for a ridged set up and performance. Existing products can be used for Swiss machine applications. New MF breaker design for excellent chip control.